The Conservative Party is on the hunt, and with the help of the NDP and Liberals, they are cleansing Canadian politics of anyone who might think of Palestinians as human beings. In the first weeks of the election campaign, two NDP politicians have had to distance themselves from statements about facts that are utterly obvious to anyone who knows Israel/Palestine, one nominated candidate has had to resign, and many more NDP members have been blocked by the party from seeking nominations to run for office. Quebec NDP candidate Hans Marotte expressed past support for the first Palestinian intifada, a mass movement against Israel’s occupation to which Israel responded with the “broken bones” policy of violent repression. When the Conservatives dug up his comments, Marotte said it was proof they couldn’t find anything more recent. He didn’t recant, but he was effectively silenced. Ontario NDP candidate Matthew Rowlinson had to issue a statement apologizing for signing an “incendiary and inaccurate” letter that included the documented and provable claim that ethnic cleansing of Palestinians is ongoing in Jerusalem. The “inaccurate” part of the letter said that Israel seeks a Jerusalem free of Palestinians. As for “incendiary,” we would do better to look at some of the weapons Israel deploys against Palestinians — more on that to come. The tortured language of this reply to disgruntled supporters is a consequence of muddled thinking. The tortured language of this reply to disgruntled supporters is a consequence of muddled thinking. In 2014, it was very clear that the monstrously outmatched Palestinian fighters were focused on military targets. Of 72 Israeli casualties, 66 were soldiers. The “horror of violence targeting civilians” was experienced mainly by Palestinians. Is the NDP saying that what Israel is doing to Palestinian civilians can be justified by “terrorism,” which presumably refers to the use of rockets by Palestinians (and not the use of heavy artillery and bombs by Israel)? He should be clear that these circumstances include the high-tech slaughter of children. NDP policy is at least a decade out of date. No one in Israel is interested in a two-state solution or a peace process. Israel took a decision just over a decade ago to “freeze” the peace process. Since then, Israel’s war against the Palestinians has continuously expanded, with attacks on Gaza’s trapped, defenceless population in 2006, 2008-2009, 2012, and 2014. To be fair, Wheeldon’s Facebook posts, which mentioned the bombings of buses by Hamas, were also a decade out of date. The last bus bombing by Hamas was around 2005, and in the ten years since, the organization — labeled “terrorist” by all parties in Canada — has focused increasingly on confronting the vastly more powerful Israeli military, while that military has focused its incredible firepower on Palestinian civilians. It may also be worth mentioning that Hamas has been fighting against ISIS in Gaza, and has lost lives doing so, while there is de facto collaboration between Israel and al-Qaeda in Syria, as Asa Winstanley and others have reported. The NDP’s response reveals that it does not understand Israel/Palestine today. How might the NDP go about gaining such an understanding? There is Amnesty International and Forensic Architecture’s Gaza Platform, which has data on every bomb and shell that Israel launched into Gaza in its 2014 attack. It reveals a pattern of attack that is hard to explain in any way except as the targeting of civilians and civilian infrastructure. It was built as an accountability tool, in the hopes that justice will eventually be done, and that those responsible for the deaths of thousands of civilians, the destruction of thousands of homes, and the deliberate targeting of hospitals, schools, medical personnel, and UN facilities will face some kind of legal consequences. Only one side, the Israeli side, controls every detail of every Palestinian life in Gaza and the West Bank. There is Mads Gilbert’s new book, Night in Gaza, in which the Norwegian doctor who has spent many years visiting Gaza describes the 2014 attack as the worst he’s seen. The book shows pictures of the heroic medics and doctors who try to save lives and treat injuries as Israel tests new kinds of shrapnel on Gaza’s children. Gilbert describes what he saw as “infanticide.” He notes that, with a median age of 18, more than half of Gaza’s 1.5 million people are children. Those children are not allowed to leave — they are sealed in behind a wall on three sides and a navy patrolling the sea on the other. Israel has imprisoned them. Gaza, notes Gilbert, is not just a prison, but a child prison. When Mulcair says, as he did in 2008, that he is “an ardent supporter of Israel in all situations and circumstances,” he should be clear that these circumstances include the high-tech slaughter of children, the imprisonment of children, the imposition of of caloric intake formulas for children, and increased infant mortality and reduced life expectancy. By a matter of simple logic, these are all things that Thomas Mulcair supports. There is Max Blumenthal’s book, The 51 Day War, with its harrowing tales of Palestinians people herded by Israeli soldiers at gunpoint into a house and forced to stay there in the house at gunpoint until the house is bombed and dozens of people are killed. It is playing the right’s game, which it can’t win. Remember that Israeli newspapers are running columns with headlines like “When Genocide is Permissible,” and Israeli politicians call Palestinian children “little snakes.” And anyone thinking that indifference to civilian lives or hateful, racist, and genocidal beliefs are common to both sides might remember that only one side, the Israeli side, controls every detail of every Palestinian life in Gaza and the West Bank, from where they can and can’t go to their very caloric intake. Israel is heading in an ever-more genocidal direction towards the Palestinians. Support for this move is only possible for those who give up any pretence of anti-racism, universal human rights, anti-militarism, and democracy. It is only possible, in other words, on the right side of the political spectrum. On the other side of the spectrum, the pro-Palestine movement and Palestinian civil society are working on a rights-based, not a solutions-based, framework, and are working towards boycott, divestment, and sanctions (BDS). Many Canadian politicians have heard of the BDS movement, at least for long enough to denounce it. Mulcair, for example, has said that he finds BDS “grossly unacceptable,” as one might expect of someone who ardently supports Israel in every situation and circumstance. If the progressive position supporting BDS is grossly unacceptable, perhaps Mulcair might find more acceptable Hamas’s conditions for a 10-year truce with Israel: an end to the siege of Gaza and the opening of a seaport, an airport, and the land crossing into Egypt. This is actually far short of the NDP’s quaint espousal of a two-state solution, since the occupation would continue. But all the same, for the NDP to call for the opening of Gaza and the freeing of 750,000 children from prison in today’s context would be politically significant indeed. It won’t happen for exactly that reason. These may be the evil political calculations that have to be made in order to succeed electorally. But here is something to consider. If the NDP purges the progressive, pro-Palestine voices from its party out of fear of supporters of Israel’s ever-escalating violence against the Palestinians, it is playing the right’s game, which it can’t win. Israel’s national politics, which has drifted so far to the right that to call someone a leftist is an insult (and “punch a lefty, save the homeland” and “good night, left side” are slogans chanted at pro-war demonstrations), could teach the NDP something about how this works. There, too, left and liberal parties spent the past few elections trying to pander to centre-right sentiment, and have basically disappeared as a political force. The NDP’s purge of pro-Palestine candidates can only help Stephen Harper, who doesn’t talk nonsense about a two-state solution but simply and openly supports whatever Israel wants and is doing. Those who want that will vote for Harper, not the NDP. Meanwhile, if voters want to cast their ballot this October for a major Canadian party that believes that Palestinians are human beings too, they can’t. 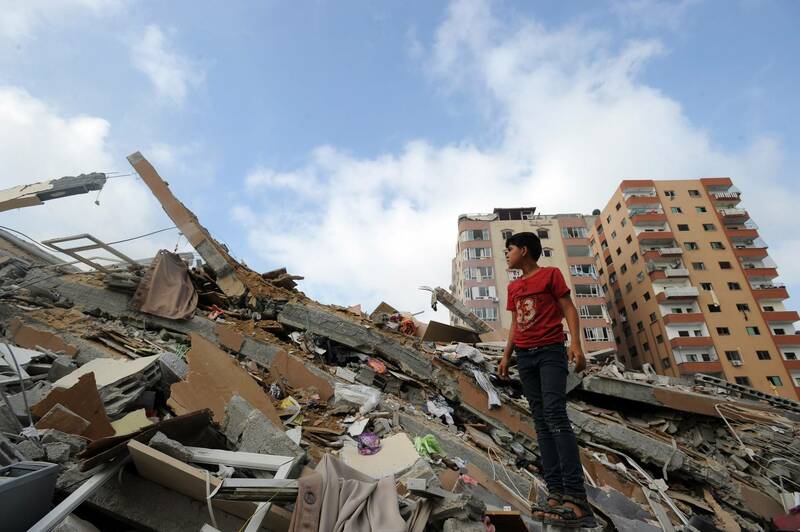 The destruction left by Israel's 2014 attack.